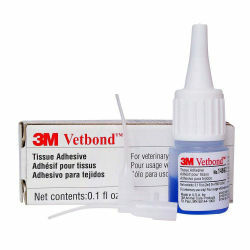 Quickly and conveniently closes minor wounds, often eliminating the need for sutures and/or bandages. Strong bond polymerizes in seconds. Economical 3 ml bottle comes with four "reusable" applicator tips. Blue dye for easy-to-see drop application. Ideal for a variety of procedures, including cat declaws, dew claw removal, closing minor lacerations, tooth extractions and oral surgery. This product is an asset to every first aid kit.